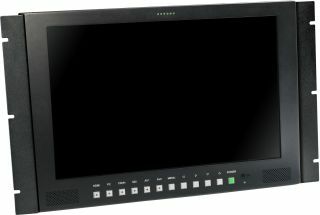 The LM-1750HD high performance Multi-format 17-inch Color LCD Monitor from TV One features inputs for SDI (either SD or HD) with an active output, HDMI, Analog RGBHV, YUV or YPbPr Component Video and 2x Composite Video. An YC input is available and can be used in lieu of one of the Composite inputs. The monitor offers five Stereo inputs with dual internal speakers and Front panel Tally LED's that can be activated externally via a DB9 connector. The unit is now shipping and has a suggested retail price of $3,950. The LM-1750HD monitor supports and automatically detects both NTSC and PAL Television Standards. It can handle Resolutions up to 1400x900 and1080p. A Sync Delay (Pulse Cross) mode allows viewing of the vertical and horizontal sync and vertical blanking intervals. A Blue Only mode facilitates accurate monitor setup when viewing color bars. The menu contains all the necessary controls to adjust contrast, brightness, sharpness, color, hue, black stretch and other parameters necessary for optimum monitor performance. Results of these adjustments can be viewed via the On Screen Display.